For the Series 400 variant of the HS 125, see British Aerospace 125. The Hawker 400 is a small twinjet corporate aircraft. Initially designed and built by Mitsubishi, it has been further developed and updated by the Beech Aircraft Company, now part of Hawker Beechcraft. It is a small, low-winged twin-turbofan aircraft of all metal construction, flown by a crew of two pilots and accommodating eight passengers in a pressurised cabin. Its wings use a computer designed, supercritical airfoil in order to minimise drag. Its two Pratt & Whitney Canada JT15D turbofans are mounted on the rear fuselage. The aircraft was originally designed as the Mitsubishi MU-300 Diamond, an all-new, all-jet development to complement and slot above the Mitsubishi MU-2 and provide Mitsubishi Heavy Industries with their top-of-the-line corporate aircraft model (hence the name "Diamond"). It first flew on August 29, 1978. Mitsubishi went on to produce 97 MU-300s, all of which were assembled by the company's United States subsidiary. In 1985 Mitsubishi sold the rights and a number of unfinished airframes to Beechcraft, who began manufacturing it as their own model, initially re-designated as the Beechjet 400, certificated by the Federal Aviation Administration in May 1986. Raytheon/Beechcraft developed improvements for the 1990 400A for longer range, higher take-off weights, luxury appointments and offering an all-glass flight deck. Beechcraft developed the T-1 Jayhawk version for the United States Air Force, used as a trainer for crew of large aircraft like tankers and strategic transports: 180 were delivered between 1992 and 1997. The Japan Air Self-Defense Force 400T trainer shares the T1-A Type certificate. In 1993 Raytheon purchased the Hawker business jets from British Aerospace, renamed the Beechjet 400 as the Hawker 400 to include it in the line and the Hawker 400XP incorporated aerodynamic, mechanical and interior improvements from the Hawker 800XP. In October 2008, Hawker Beechcraft upgraded it as the Hawker 450XP including new, more fuel efficient Pratt & Whitney PW535Ds with 2,965 pounds of thrust each but it was canceled in June 2009 due to poor economic conditions. Nextant Aerospace re-manufactures it as the 400XT, replacing the JT15Ds with Williams FJ44s and adding new avionics and interior, it was FAA-certified in October 2011. Up to one-third of the 400A/400XP fleet could be retrofitted, enabling improved range, speed and fuel efficiency. It should keep their resale value to remain in economic service for another twenty to thirty years, like Falcon 20s reengined with TFE731s. In 2014 most were U.S. registered, a majority with single aircraft operators. Flight Options and Travel management co. were its largest operators as NetJets Europe has disposed of its fleet. The second highest concentration was in Mexico, then Brazil, the rest were scattered throughout the world. The USAF operated 178 T-1A Jayhawks. Charter and fractional operators fly at least 800 to 900 hours per year while most corporate operators fly 300 to 400 hours. In 2014, 400A values range from $500,000 for mid-time 1990 models to $1.3 million for 2003 models, a 2004 Hawker 400XP commands about $1.5 million and last 2010 models were listed at least for $2.5 million. Initial model. Two prototypes and 89 production aircraft built, 56 in active use as of 2014. Improved version of Diamond I; 11 built, all subsequently redesignated as Beechjet 400s. The Diamond II built after Beechcraft bought the MU-300 production rights from Mitsubishi. 54 built in addition to the original 11 Diamond IIs. 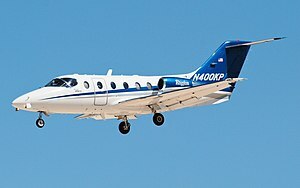 Upgraded model, initially produced as the Beechcraft Beechjet 400A, then Raytheon Beechjet 400A, then Raytheon Hawker 400XP, then Hawker Beechcraft Hawker 400XP. One prototype converted from Model 400 and 593 built as of the end of 2009. Military version of the Model 400A, 180 built for the United States Air Force as the T-1 Jayhawk and 13 built for the Japan Air Self-Defense Force. In Japanese service they are referred to as T-400. A factory engineered and supported upgrade first flown May 2012. The conversion features new avionics, interior, winglets, and Williams FJ44-4A-32 engines. The first fully configured was delivered on July 20, 2017, the upgrade can be performed in 12 weeks with a choice of Rockwell Collins Pro Line 4 to 21 or Garmin G5000 avionics, it provides 33% more range to 2,160 nmi (4,000 km) with four passengers, better hot and high performance and a 19 min climb to FL450 at max takeoff weight. ^ a b c d e f Fred George (December 10, 2014). "Operators Survey: Beechjet 400A/Hawker 400XP/Nextant 400XT". Business & Commercial Aviation. ^ "Mitsubishi MU-300 production list". rzjets. ^ "Beech 400 Beechjet production list". rzjets. ^ Taylor, John W.R. (editor). Jane's All The World's Aircraft 1988-89. Coulsdon, UK: Jane's Defence Data, 1988. ISBN 0-7106-0867-5, pp. 339–340. ^ Whitaker, Richard. "Diamond 1:Mitsubishi's first business jet". Flight International, July 18, 1981, pp. 163–167. ^ Field, Hugh and Hurst, Mike. "The Great St Louis Meeting". Flight International, September 30, 1978, pp. 1261–1266. ^ "Nextant Aerospace Receives FAA Certification for the 400XT" (Press release). Nextant Aerospace. October 5, 2011. ^ Hawker Beechcraft aircraft Serial Number Lists 1945 to present Archived March 7, 2010, at the Wayback Machine retrieved March 19, 2010. ^ LAASdata list of Beechjet 400/Hawker 400/T-1/400T aircraft retrieved March 19, 2010. The list includes US and Japanese military variants but these have not been included in the total. ^ "A Score Of New Business Aircraft Are Planned". Aviation Week & Space Technology: 68. October 14, 2013. ^ Chad Trautvetter (July 20, 2017). "Textron Delivers First Fully Configured Hawker 400XPR". Aviation International News. ^ Taylor, Michael J.H. (editor). Brassey's World Aircraft & Systems Directory 1999/2000. London:Brassey's, 1999. ISBN 1-85753-245-7, pp. 521—522. This page was last edited on 29 December 2018, at 06:30 (UTC).